Bangladesh being neighbored by India shares a common Bengali culture and language with the neighboring state of India – West Bengal. It is not just the culture and language that Bangladesh shares with Indian Territory but the history too as it was once been a part of India. If we look through its history, it gives a perception that the cuisine would also be influenced from the Indians as Bangladesh was originated from India. It is somewhat true as the shared culture influences the cooking. Some of the dishes included in Indian cuisine are shared over the boundary which is known as the Bengali cuisine. Bengali cuisine is famous in Bangladesh but the primary cuisine is known as Bangladeshi cuisine which is quite different from the usual Bengali cuisine. Bangladeshi cuisine has been largely influenced from South Asia and is thus South Asian in nature. The cuisine showcases an ample use of fish as Bangladesh is known as the land of rivers and has close proximity to the sea. Therefore, fish is the staple food here. It is not just the sea food which is prominent in Bangladesh but also the fiery pastes known as ‘chutney’. These pastes are made up of spices, ground roots and chilies. They exhibit a taste so fiery that it can make you teary-eyed but you still want to have it because of the relishing taste. These pastes form a base of Bangladeshi cuisine. Almost every dish has the use of these ground pastes. There are other colorful ‘chutneys’ too which are accompanied by some of the dishes and are extremely yummy. 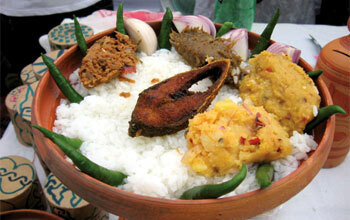 The best of Bangladesh can be tasted in the streets and the villages. The other places which one should not miss to savor the Bangladeshi cuisine is the Khulna Restaurants, Srimangal Restaurants and eating in the Chittagong Hill Tracts. Maach Bhuna (Fish Bhuna), chicken curry, ground pastes, bhindi bhaji( fried lady finger), begun bhaja (fried eggplant) and lentils are the local specialties of the place eaten with bhat (boiled rice). 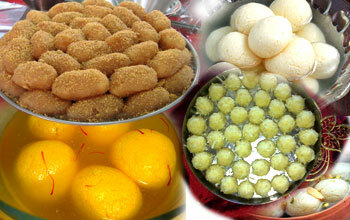 Mishti doi, Rasmalai and Rasgulla are the prominent deserts which is also a part of Bengali cuisine. Shopping: Bangladesh is a splendid paradise for shopaholics. The country has an opulent tradition in handicrafts which offers amazing opportunities to shop in this elegant land. Ancient Dhaka showcases a significant influence from the past but this does not mean that the place lacks in contemporary allurements. The place is dotted with lovely shops that are replete with fascinating paintings, incredible wood works, shital pati - cooling mattresses, traditional dolls, beautiful decorative items made up of bamboo, cane and conch shell products. These items are beautiful crafted by the locals and are sold at extensively reasonable prices. Gold & silver ornaments, pure cotton, silk and jute, reed, glistening brassware, and leather are also a good buy here as it is prominent for its best quality. For such variety, the place has got deep appreciation from arts and crafts lovers. The best buy in Bangladesh is the pink pearl. It is widely famous and known for its best quality pink quality pearls.